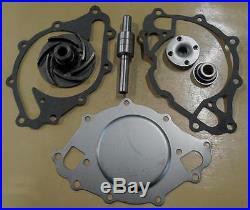 1966-68 Ford Mustang, Fairlane 289 HIPO "K" code new water pump rebuild kit. 1966-68 Ford Mustang, Fairlane with 289 Cid HIPO "K" code engines. 1966-68 Mercury Comet with 289 Cid HIPO "K" code engines. This new water pump kit consists of the following parts. 1- new water pump bearing. 1- new water pump unitized seal. 1- new replacement HIPO 6-fin impeller. 1- new water pump back plate. 1- new back plate gasket. 1- new water pump mounting gasket. This kit is for both the C5OE and C6OE cast iron water pump housings only. The C8AE cast iron housing takes a different bearing, but everything else is the same. This is a new cast iron repoduction of the original Ford HIPO 6- curved fin water pump impeller. These are made to be pressed fit on to a new standard. You will need a unitized water pump seal installation tool that is not provided in this kit. If you are not familiar with the rebuilding process you should not try to rebuild it yourself and should send it in to be rebuilt. We are located in Albany Oregon. The item "1966-1968 Ford Mustang, Fairlane 289ci HIPO K code NEW water pump rebuild kit" is in sale since Tuesday, August 23, 2016. This item is in the category "eBay Motors\Parts & Accessories\Car & Truck Parts\Cooling Systems\Water Pumps". The seller is "hartbroscoreco" and is located in Albany, Oregon. This item can be shipped worldwide.